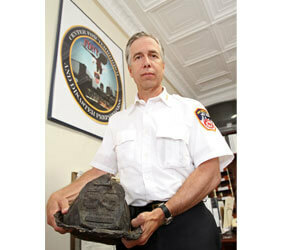 RYE, N.Y. – As Chief Joseph W. Pfeifer of the New York City Fire Department sees it, the 9/11 terrorist attacks were a global trauma and the 10th anniversary of the attacks provides a transformative opportunity for the world community to pause and think about the tragedy’s spiritual dimension and its aftermath. On Sept. 11, 2001, Pfeifer was chief of the 1st Battalion, one of the first on the scene and in charge of directing firefighter response in the north tower of the World Trade Center. He met his firefighter brother in the lobby of the building as Lt. Kevin Pfeifer responded to the second alarm. They exchanged a few words, and Kevin headed up the stairs. He helped evacuate workers and directed other firefighters to safety, but he was killed in the collapse of the building. “People were angry at God and they had every right to be, but that was not my experience,” Pfeifer said in an interview with Catholic News Service. “I was walking back to the firehouse from the site on the second day, when we knew there would be no more survivors. It was completely dark except for the lights we had brought in. There was no power and there was smoke everywhere. “Instead of anger, I felt an encounter, as if I was coming back to an old friend, or putting on an old sweatshirt. I had wrestled with God and spirituality before. I had had the experience of being in a conflicted place and trying to understand what it means,” Pfeifer said. Pfeifer graduated from Cathedral College in Douglaston, N.Y., and studied two years at Immaculate Conception Seminary in Huntington, N.Y., from which he later earned a master’s degree in theology. He said he was familiar with wrestling with God and trying to figure out what he was called to do with his life. He is now the chief of counterterrorism and emergency preparedness for the New York City Fire Department and addresses groups of people in many parts of the world. Pfeifer said there is transformation through trauma. “We used to think the 9/11 attacks were just New York and D.C., and Pennsylvania, but they were more than that,” he said. “It was a global trauma, an entire world encounter and transformation occurred” when people could see that all local acts of terrorism, whether in Ireland or Israel or Afghanistan, were represented at the World Trade Center. “It gave the victims of terrorism an international voice and showed that terrorism is a crime against humanity,” he said. People encounter spirituality in different ways, he said, and the 10th anniversary will allow people to connect their individual experiences with those of people in a larger group. One such larger group devastated by the Sept. 11 attacks lives in Rockaway Peninsula at the southwest tip of the Diocese of Brooklyn. Rockaway is a relatively isolated section of the populous borough of Queens. Generations of New Yorkers have escaped the summer heat on its Atlantic Ocean beaches and more than 100,000 people are now full-time residents of the handful of communities that span the narrow 10-mile stretch. The barrier peninsula is known locally as the Irish Riviera because it attracted so many New Yorkers of Irish ancestry. Rockaway is home to firefighters, police officers, emergency responders and financiers and the collapse of the World Trade Center tore a huge hole in the heart of the peninsula. Seventy residents were killed in the disaster. Many of them worshipped at one of the eight Catholic churches that punctuate the flat, sandy neck of land. Pfeifer is a longtime summer resident of Breezy Point and worships at St. Thomas More in Rockaway Point. He described one of several memorials on the peninsula that includes quiet spaces to encourage reflection. Monsignor Martin T. Geraghty was pastor of St. Francis de Sales in Belle Harbor in 2001. Twelve of the World Trade Center victims were buried from the church. On Nov. 12, three days after the last funeral, Monsignor Geraghty was celebrating the 9 am Mass when an American Airlines flight bound for the Dominican Republic crashed one block from the church, killing all 260 people on the plane and five on the ground, including parishioners. Monsignor Geraghty said tribal human hearts is his way to describe that human beings have only had a short time of mindfulness since their creation and still have a long way to go. “We’re at the beginning of this. God is calling us out of tribalism into a different understanding,” he said. Rosellen Dowdell is the widow of Lt. Kevin Dowdell, who was a New York firefighter. She is a parishioner at Blessed Trinity Parish, which includes three churches in Rockaway. Monsignor Michael J. Curran, pastor of Blessed Trinity, said 10 years after the disaster, “So many of these families, who have every reason to be angry at God, have not given up. They are still faithful. I’m more aware of the spiritual strength of people. Folks are not fair-weather friends of God. “The question of ‘why?’ is still out there, but they are willing to trust God and keep him at the center of their lives. Nobody has just slammed down their bat and ball and gone home,” he said.